For calmness, feeling of comfort and harmony…. Linden tree and its golden blossom are known as effective mean to fight the stress, trouble and tiredness. 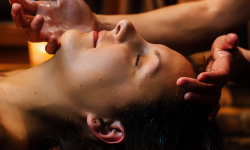 Ritual stops the time and lets us to experience care of Latvian nature about mind and body harmony combined with the care of SPA professionals about feeling of comfort, calmness and health. Linden blossom ritual includes 6 steps for getting over peacefulness, feeling of comfort and harmony.